During the 36-day cruise, Sager and his students will collect data that will help them understand how Tamu Massif was formed. Along the way, the students will gain valuable hands-on experience that will prepare them for careers as geophysicists. Students will work in shifts, keeping a cruise log and monitoring equipment. In-between these shifts, they will process the collected data, to get an understanding of what the instruments are recording and see the immediate results of the survey. 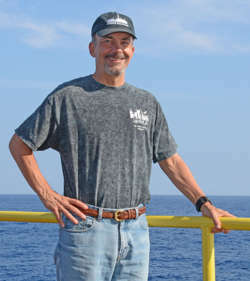 “When the students see data that they’ve collected at sea, they’ll have a very visceral memory of what that really means,” Sager said, pointing out that fieldwork is often an integral part of a geophysicist’s career. At 120,000 square miles – roughly the size of New Mexico – Tamu Massif is the largest known single volcano on Earth, located in the Pacific Ocean about 1,000 miles to the east of Japan. To put that size into perspective, Mauna Loa, which is the world’s second largest volcano, is 2,000 square miles, a tiny drop in comparison to Tamu Massif’s sprawling expanse. In 2013, Sager, who has been studying Tamu Massif for over 20 years, was able to definitively prove that Tamu Massif is one single volcano. Now Sager is returning, with the goal of understanding how this massive volcano was formed. How Did The World’s Largest Volcano Form? “There are two main hypotheses about how Tamu Massif formed: the plume head hypothesis and the fertile mantle hypothesis,” Sager said. The plume head hypothesis states that volcanoes erupt because a huge blob of hot magma (plume) slowly rises from the boundary between the Earth’s core and mantle, finally erupting at the surface. This hypothesis would suggest short, fast eruptions, with magma spreading out widely in all directions. Sager describes the fertile mantle hypothesis as eruptions that happen because of lava oozing out of cracks and fissures in the tectonic plates – including oceanic spreading ridges. This hypothesis suggests more gradual eruptions with lava flows that do not go far from the ridges. Tamu Massif is unusual because it formed during a time when the magnetic fields were reversing. As lava cooled on the ocean floor, it became magnetized along the direction of the existing magnetic field, leaving a permanent record of the field at the time of cooling. Recording magnetic information will help Sager and his students understand how Tamu Massif formed. “If we look at the two different hypotheses, they give us different expectations. If Tamu Massif just formed at the ridges, what we expect to see is magnetic ‘stripes’ with thick oceanic crust being formed at the ridge over time. But if we have a massive pulse of volcanism and the lava flows go long distances, then we wouldn’t see these coherent magnetic ‘stripes,’” Sager said. The current magnetic data from Tamu Massif tells a conflicting story: there are magnetic ‘stripes’ observed on the north side of Tamu Massif but none on the south side. In order to answer questions about these two differing hypotheses of Tamu Massif’s formation, more data are needed. “The current magnetic map of Tamu Massif looks like someone threw a pot of spaghetti on it. Most of the magnetic data was gathered in the ‘60s and ‘70s, before GPS navigation, and the cruise tracks are irregular in spacing and coverage,” Sager said. Collecting a grid of magnetic data using GPS navigation will allow Sager and students to fit in the pre-existing data with the new data, filling in gaps of knowledge and formulating conclusions about Tamu Massif’s formation. “I’ll be able to say I’ve been on board a ship, that I know how to deploy this equipment, how it runs, how it functions, and that I understand the process from start to finish, from ‘here’s a question’ to ‘here’s the answer,’” Welch said. “I’m hoping this will broaden my experiences in different fields of geophysics,” Pineda said. The research cruise will be aboard the R/V Falkor, which is owned and operated by the Schmidt Ocean Institute, a nonprofit organization dedicated to advancing ocean research, discovery and knowledge. Support for the research on this expedition is provided by Schmidt Ocean Institute, National Science Foundation and National Geographic Society. Outreach efforts will consist of ship-to-shore presentations, using the Falkor’s broadband capabilities, to inspire future scientists and promote science and ocean literacy. Working with outreach specialists from Texas State Aquarium and Schmidt Ocean Institute, Sager and his students will be in regular communication with students in their classrooms and several museums, including Texas State Aquarium, Houston Museum of Natural Science, and Aquarium of the Pacific.